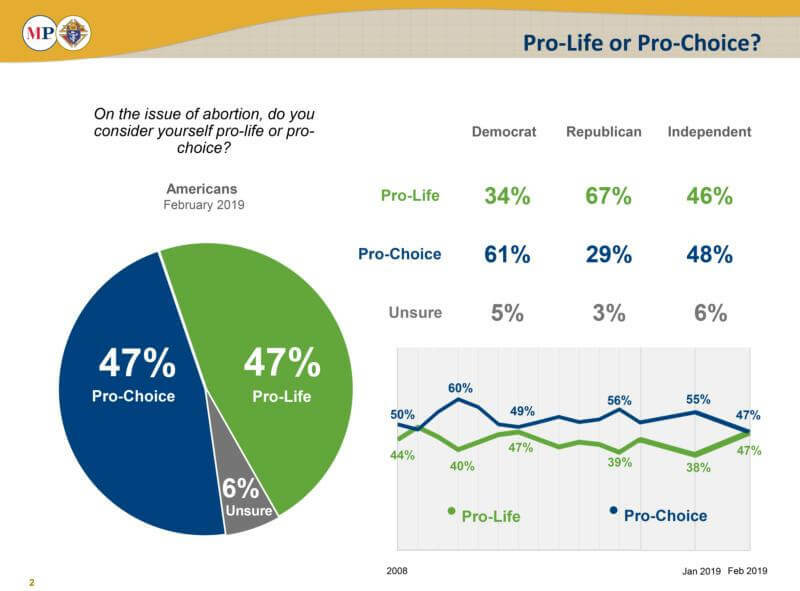 NEW HAVEN, Conn. — Americans have shifted toward a pro-life stance in recent weeks during a period when some states are considering legislation that would legalize abortion up until birth, according to a new poll. The Marist Poll at Marist College conducted in mid-February found that equal numbers of Americans — 47 percent — identified themselves as pro-life and as those who support abortion. The findings reflect a dramatic shift from a similar poll in early January that found respondents supporting abortion by 55 percent to 38 percent. “Current proposals that promote late-term abortion have reset the landscape and language on abortion in a pronounced, and very measurable, way,” Barbara Carvalho, poll director, said in media release from the Knight of Columbus, the poll sponsor. The largest swing in responses came from self-identified Democrats and people younger than 45, poll officials said. The poll reported that among Democrats, the gap between people who identify as pro-life and those who support abortion was cut in half from 55 percent to 27 percent. The number of Democrats who identify as pro-life stood at 34 percent, up from 20 percent in January. Similarly the number of Democrats who said they support abortion fell to 61 percent from 75 percent. Young respondents in February were almost evenly divided with 47 percent identifying as pro-life and 48 percent as supporting abortion. The figures represent a dramatic shift from January’s poll in which 28 percent of young people said they were pro-life and 65 percent supported abortion. Carvalho attributed the wide swing to legislative attempts to allow later-term abortions. “In just one month, there has been a significant increase in the number of Americans who see themselves as pro-life and an equally notable decline in those who describe themselves as pro-choice,” she said in the media release. The poll also found overwhelming opposition to later-term abortions. By a nearly three-to-one margin — 71 percent to 25 percent — respondents said abortion generally should be illegal during the third trimester of pregnancy. About 66 percent of adults said abortion should be banned after 20 weeks except to save the life of the mother, while 18 percent said abortion should be allowed any time until birth. Five percent said abortion should be banned altogether. Further, 80 percent of respondents would like to see abortion limited to the first three months of pregnancy at most. The number represents a 5-percentage point increase since January. A breakdown of that figure shows includes 65 percent of respondents who support abortion, 64 percent of Democrats, 92 percent of Republicans and 83 percent of political independents. The poll surveyed 1,008 adults Feb. 12-17 with a margin of error of plus or minus 3.5 percentage points.